Ah, it is barbecue season. I love stepping outside and sniffing the evening air with its aroma of dinner on the grill. 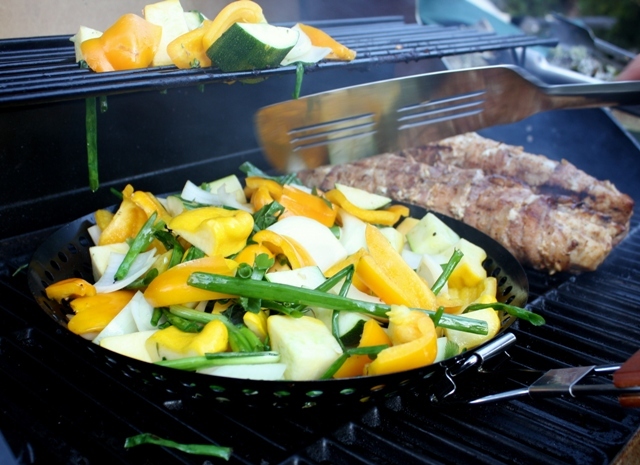 There are so many reasons to grill, it is fast, low fat, delicious and fun. There is only one reason not to and it is kinda big; carcinogenic compounds can form on your food. The way that this happens is that the high temperatures that are used in this way of cooking cause the amino acids in the meat to react to form Heterocyclic Amines (HCA). The longer you cook a meat on the grill the more HCAs it will have. A medium rare steak will have very few HCAs, but grilling thick pieces of chicken with the bone in will have much more. There are also other harmful compounds that can come from the smoke such as Polycyclic Aromatic Hydrocarbons (PAH) and a few others I can’t pronounce. Great way to rain on a BBQ huh? But don’t give up on the grill at yet! Fortunately thanks to brainiacs sequestered in BBQ labs somewhere there are a few simple techniques that significantly reduce HCAs and their cohorts making it safe to BBQ. Marinade your foods before you grill them. They haven’t figured out why but marinating your foods will significantly reduce all the unpronounceables. Lucky for us, it also tenderizes the meats and imparts more flavors. Trim the fat and move meat away from flare ups. By trimming the fat on the meat, it will reduce the amount of flare ups on the BBQ which cause the HCAs. Take care to move your food away from the flare ups as well. Flip your food often. This is idea makes some cooks cringe, but nonetheless it significantly reduces the carcinogenic compounds. Don’t overcook. Need I say more? Keep your grill clean. By cleaning the grill every time you use it, the HCAs and PAHs won’t build up on your grill and consequently your food. Grill smaller sizes of meat. Choose smaller cuts of meat to grill or make kabobs. The faster your food gets off the grill the better. Try grilling something different. Meat isn’t the only thing to BBQ. Try veggies or even pizza! Have some wine with your BBQ. (Honestly, I didn’t make that one up!) The anti-oxidants in wine may provide at least a partial antidote to the HCA and PAH. Believe it or not, potato salad is supposed to do a similar thing. So get on out there, clean the grill, open some wine, make a potato salad and have a delicious summer grilling healthy. 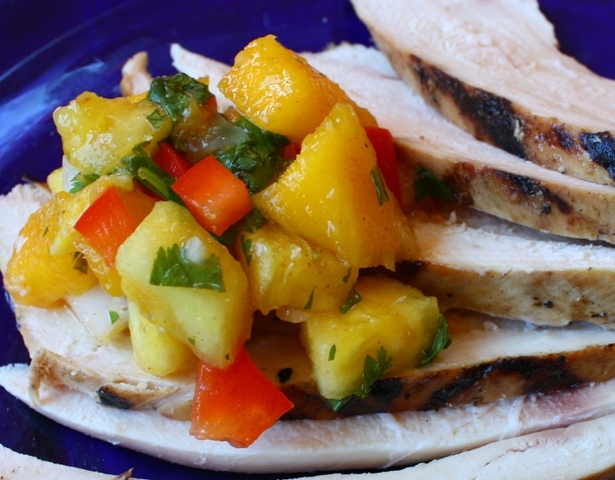 This is one of my all time favorite grilled chicken recipes. The fruit salsa will blow your mind with it! First things first. Get out the blender or the food processor and whirl all the marinade ingredients into a froth. Wash your chicken with cool water and place in a bowl. Pour the marinade over the chicken and tuck in the fridge for an hour, turning the chicken occasionally to evenly marinade. Don’t marinade over an hour or the chicken gets all mushy! While the chicken is marinating, gently fold all the fruit together for the fruit salsa in a festive bowl. Sprinkle the lime juice, cumin and salt over the fruit and the gently fold into it. Set in the fridge to chill. Brush your grill racks with a bit of olive oil then heat up the grill. Take the whole bowl of chicken and marinade out to the grill. Arrange the chicken on the grill and discard the marinade. Start the breasts, fleshy side down. Grill 5 minutes, then turn the chicken over, grill another 5 minutes. Keep turning the chicken every five minutes till the meat thermometer reads 165 degrees or cut open the fleshiest part of the breast and it is no longer pink. Watch those thighs! They will be done much quicker than the breasts. Serve with the fruit salsa and salute!